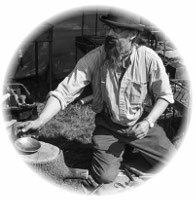 The Copper Elf is a brazier -maker of domestic copperware items- and a blacksmith specialising in historic reproductions for museums, educators, reenactors and all other interested people. 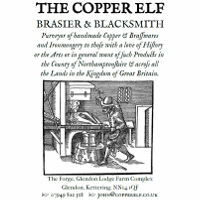 The Copper Elf's blacksmith work can be seen in local churches and farm houses whilst his copper and brassware has been used in nationally important museums and educational venues. 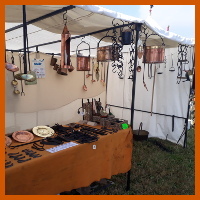 Current pricing of regular copper, brass and blacksmith lines can be found in the catalogue pages along with examples of copper work and blacksmithing. The catalogue pages also contain details of copper care and cleaning. 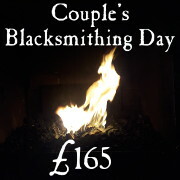 If you want to discuss or order a special commissions please email the Copper Elf directly or drop him a Facebook message. 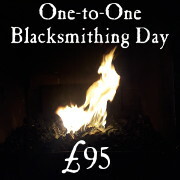 The Copper Elf runs one day one-to-one blacksmithing experience days and courses from £95/day (couple's days are also available at £165/day).